UPDATE: Randi has donated more copies of the book. Boetti is again available! Thanks, Randi! American photographer and AHOB member Randi Malkin Steinberger offers an intimate portrait of the production of Italian conceptual artist Alighiero Boetti’s pivotal embroidered works by Afghan refugees in Pakistan. 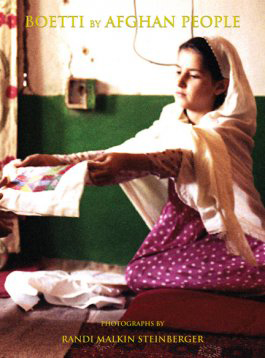 In 1990, Randi Steinberger traveled to Peshawar, Pakistan, with Boetti’s blessing to document the process of the making of his embroideries. When they returned to Rome, Randi and Boetti together selected 55 color photographs for a future book. Two decades after the photographs were taken, they are being published to tell the story for the first time in this beautiful, multi-layered and cloth-covered edition printed in Italy.